Although women now comprise a majority of the veterinary profession, for decades they were more likely to be found running the clinic while their husbands cared for sick animals. These women organized themselves a century ago on the basis of their shared loved for the profession. Now, the members—men as well as women—are celebrating this centennial milestone and the profound impact their group has had on the profession. Membership was open to wives, daughters, mothers, sisters, and widows of veterinarians. The 55 founding members set annual dues at 50 cents and elected Mrs. W. Horace Hoskins of Philadelphia as their first president. Each state was to select a secretary to report to the national auxiliary. From the start, the women received backlash. “Creation of an Auxiliary to the AVMA was not a wholly popular idea. Some veterinarians always had taken their wives with them to meetings, where each got together with other wives informally for food, fun, and the swapping of ideas on how to be a good wife to a veterinarian. However, some men did not want wives at the meetings. It was even rumored that a few felt that the presence of women hampered their social freedom. Many more felt that women would soon be running everything if given a chance, and it was a rather general opinion that women had no place in their husband’s business. Remember, in 1917 women didn’t even vote,” according to the 50th anniversary book. In fact, at the next year’s AVMA annual meeting in Philadelphia, opposition leaders stationed themselves at the Auxiliary’s meeting-room door to block entry, but supporters prevailed. In 1923 in Montreal, challengers again tried to dissolve the Auxiliary but were foiled. Two years later, a representative from the AVMA addressed the group for the first time, and since then, the two organizations have worked together closely. As the Auxiliary grew, it organized more formally with an Executive Board and officers. In 1930, a movement was begun to encourage formation of state auxiliaries, laying the foundation for the Auxiliary House of Representatives, later called the House of Delegates. By the 1947 meeting, there were 25 well-organized state auxiliaries. And by 1948, each Junior AVMA organization at a veterinary school had an auxiliary, five of which had affiliated with the AVMA Auxiliary, according to the book. At its 1959 meeting, the Auxiliary adopted a new constitution that closely paralleled the AVMA’s. Each state or provincial auxiliary was allowed a delegation of one to seven members. That fall, the Auxiliary set up its office in the AVMA headquarters in Chicago, which led to a closer relationship and exchange of ideas. 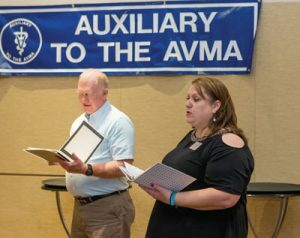 A major shift came in 1977 when the Women’s Auxiliary to the AVMA changed its name to its current title, the Auxiliary to the AVMA. “Deletion of the word ‘Women’s’ is significant because it enables all members of a veterinarian’s immediate family to join the Auxiliary. The Auxiliary officers view the potential for greater involvement of the entire family as desirable for the individual veterinarians and for the betterment of the profession,” according to a JAVMA article that year. Today, the Auxiliary has membership categories besides those for family members. One category is for other people involved in the profession, such as clinic staff or VMA employees. Another is for people who just love animals and want to join. The Auxiliary has continually adapted its objectives to meet the changing needs of the veterinary profession. Its original mission was to give financial assistance to families of veterinarians injured or killed during World War I. But with the need for war relief over by the 1919 convention, the objective changed to one of giving money to families with veterinarians who had become temporarily or permanently disabled, according to the 50th anniversary book. In 1921, the Auxiliary authorized a student loan fund and amended its objective to state: “The object of the Auxiliary shall include a loan fund to be used for the assistance of needy veterinary students.” That year, a student at The Ohio State University received the first loan, of $175. Demand for loans reflected the events of the day. The Stock Market Crash of 1929 drove up demand, as did the Great Depression. In 1947, demand dropped, with many returning World War II veterans receiving educational grants under the GI Bill of Rights. Looking for additional ways to serve veterinarians, the Auxiliary became more active in other realms, particularly public relations for the profession. In 1945, it produced the booklet “What the Veterinary Profession Means to the Public.” Over the years, the Auxiliary also produced pamphlets such as “Veterinary Medicine as Professional Career for Women” and “Dimensions of Veterinary Medicine,” along with books such as “Veterinarians and What They Do,” the “AVMA Auxiliary Coloring Book,” and “The World of the Veterinarian.” Videos included “Petpourri,” a series of four tapes for grade school children focusing on pet care and wellness. A media kit was introduced in 1980 to help with public service announcements for TV, radio, and newspapers. In 1973, the Auxiliary appointed a panel to compile a list of books that would enhance the profession, and two years later, the organization distributed its first “approved booklist” to librarians across the country. To fund these endeavors, the Auxiliary became adept at fundraising. The first effort came at the behest of then–AVMA president Dr. C. Peter Zepp in 1951, when the Auxiliary started fundraising for research. A decade later, it achieved its goal of conducting a campaign to raise $75,000 for fellowships to be awarded through the research fund. On top of that, the Auxiliary’s popular Marketplace of States, an AVMA convention event featuring items sold by constituent auxiliaries, often netted thousands of dollars. By 1987, the annual event had reached its $1 million mark in total earnings. Most proceeds went toward the student loan fund, but some also financed other educational programs. In 1976, the Auxiliary donated $10,702 toward the new veterinary exhibit at the Museum of Science and Industry in Chicago, and, in 1991, it contributed $10,000 for partial funding of an AVMA Congressional Science Fellowship. The Auxiliary compiled and sold cookbooks for other projects as well. For example, it raised money for an automatic flagpole for the first headquarters building the AVMA purchased, in 1975 in Schaumburg, Illinois. In the coming months, the organization will place a commemorative bench on the grounds of the current AVMA headquarters, also in Schaumburg, in recognition of the Auxiliary’s 100th anniversary. The Marketplace of States ended after 2005, but Kimberly Topper, of Gaithersburg, Maryland, who was president of the Auxiliary in 2000-01, enjoyed the fundraiser especially because constituent auxiliaries brought unique, often handmade items such as carved figurines as well as local goods, from Vermont maple syrup to California avocados. Although the marketplace no longer takes place, the Auxiliary continues to hold its annual Kritters Korner Gift Store fundraiser at the AVMA Convention and Western Veterinary Conference every year. 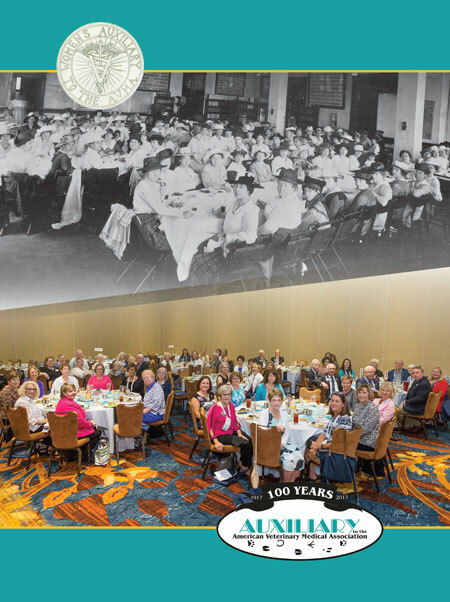 Greg Mooney, immediate past president of the Auxiliary to the AVMA, and Allegra Mooney-Waldron, president, read aloud a brief history of the organization during the Auxiliary’s July 2017 luncheon celebrating its centennial. Above all, the thing Topper and other Auxiliary members enjoy most is the social aspect of the organization. Indeed, socialization has been integrated in the Auxiliary’s structure from day one. “Veterinarians’ wives, though characteristically altruistic and hard working, have never confined themselves solely to serious projects; they have always coupled their work efforts with fun,” according to the 50th anniversary book. Whether a moonlight cruise on the St. Lawrence or a glass-bottom boat ride along Catalina Island, an excursion to Mount Rainier or a clambake in New England, Auxiliary members found fun amid their work and encountered history along the way. In 1933, they visited the Chicago World’s Fair, and in 1959, the Truman Library in Independence, Missouri, where former President Harry S. Truman addressed them. Aviatrix Amelia Earhart spoke at an Auxiliary luncheon held for the wives of foreign visitors at the 1934 New York meeting. The Women’s Auxiliary celebrated its golden anniversary in 1967 in Dallas’ Baker Hotel. Auxiliary board members costumed in clothes fashionable in 1917 served as hostesses. Entertainment was a look at “Hats and History” from 1896-1967. Decorating the tables were dolls dressed by constituent auxiliaries in fashions of the preceding 50 years. For the 75th anniversary in 1992 in Boston, members were treated to a performance by the Boston Classical Orchestra. Diamond-shaped crystal clocks and official Auxiliary history books were handed out as mementos. During AVMA Convention 2017 in Indianapolis, the Auxiliary’s 100th anniversary festivities involved a silent auction with baskets donated by past presidents of the Auxiliary and the AVMA Board of Directors in addition to individual student chapters of the AVMA, most of which provided a “school spirit” basket. The main Auxiliary centennial event—a luncheon—featured decorations and giveaways carrying the theme of the 10-Carat Diamond Jubilee, as did the Auxiliary’s 100th anniversary book. Topper, whose husband, Dr. Michael Topper, is the 2017-18 AVMA president, said she’s met lifelong friends through the Auxiliary. “No matter where we go, we know somebody, whether it’s through the military or the Auxiliary or the AVMA. Knowing that there’s always somebody there who knows what you’re dealing with or going through, who you can reach out to, is critical,” she said. Allegra Mooney-Waldron, president of the Auxiliary, agrees. She points out that compassion fatigue, too, is not something that only veterinarians but also their families deal with on a daily basis. Mooney-Waldron, who works as the practice manager at Maple Run Veterinary Clinic in Mount Gilead, Ohio, which is owned by her mother, Dr. Martha Mooney, sees it firsthand. Indeed, the Auxiliary has struggled to remain as relevant as possible, given the gender shift that led to employed female veterinarians outnumbering males in 2009, a trend associated with a corresponding decline in Auxiliary members. 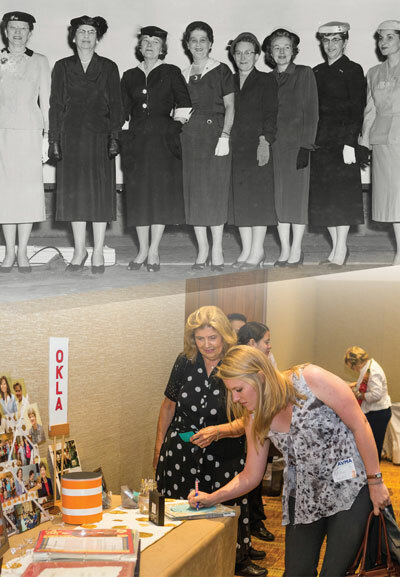 In its first 40 years, the Auxiliary saw its membership increase from the original 55 charter members to 6,000. Membership peaked at more than 10,000 in 1971. But by 1990, the number had fallen to 6,460, and by 2000, it was 2,765. As of July 2017, the Auxiliary had about 700 members. With the decline in Auxiliary membership, some have called for the organization to dissolve. A resolution outlining a plan for voluntary dissolution was submitted to the Auxiliary HOD in 2011. In August 2012, however, delegates passed a resolution from the Auxiliary board postponing indefinitely the resolution for voluntary dissolution. The Auxiliary also continues to do good works. In 2011, the Auxiliary House of Delegates authorized the organization’s Executive Board to convert the student loan fund to become the Auxiliary to the AVMA Legacy Endowed Scholarship Program. The program, administered by the American Veterinary Medical Foundation, awards $1,000 scholarships to second- and third-year veterinary students at each of the 30 U.S. veterinary colleges. Auxiliary officers (1956-57, top) and members (today, bottom) alike have been committed to supporting veterinarians. In fact, the Auxiliary plans to double the amount of scholarships it awards, starting this year. In addition, the organization still promotes National Pet Week, an annual event the AVMA and Auxiliary created in 1981 to foster responsible pet ownership as well as recognize the human-animal bond and increase public awareness of veterinary medicine. It is held the first week of May. The Auxiliary’s impact on the veterinary profession has been profound, be it in teaching the public what veterinarians do or raising money for worthwhile efforts, and members say they will continue to carry on that legacy for the foreseeable future.